Fully integrated level measurement that creates more effective transports, reduces lead times and eliminates waste. 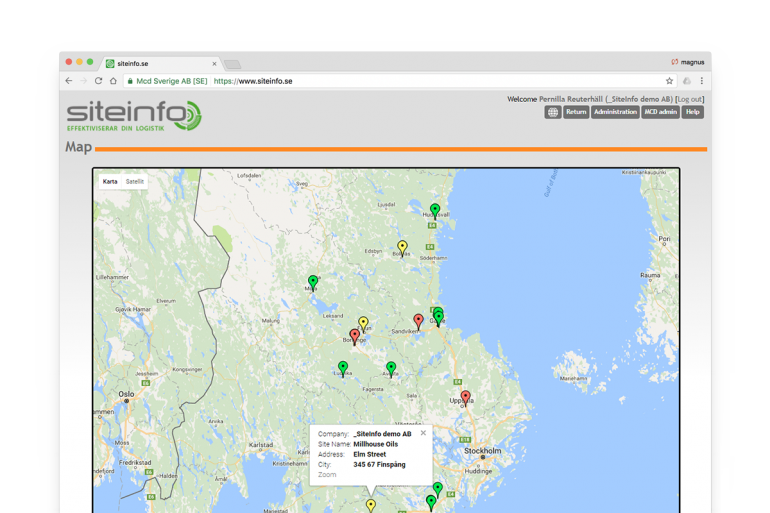 SiteInfo is a cloud based level measurement service that makes your logistics simpler and more effective. 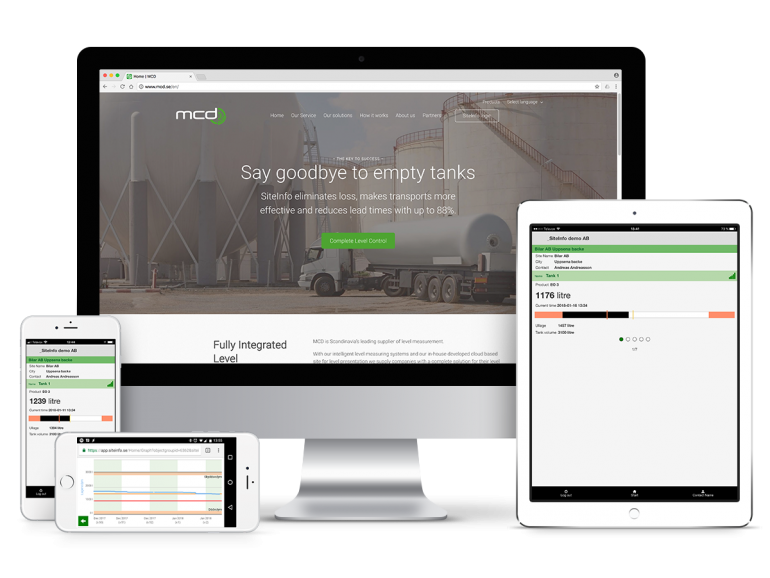 Regardless of the time, by simply using a browser, tablet or smartphone you will be able to read a multitude of information regarding your tanks. Without the need for onsite personnel you will immediately know the present volume of the product in the tank. You will no longer have to deal with empty tanks, unnecessary deliveries and costly returns. When loging in to SiteInfo, all the sites that are connected to the service are shown. You gain a quick overview of all your sites and relevant information. You are able to customize this overview page to show and sort the site according to your own needs, e.g by name of site, city or by product. When the number of connected sites begin to grow you can quickly find the information you need by combining your choice of columns and filters. If you need an email notification when the level reaches the set alarm level you are able to configure this for each tank. Level history is saved hour by hour and is presented in both a table and a graph. 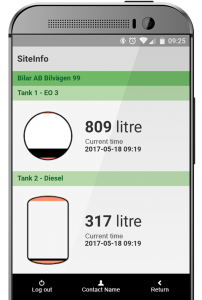 With SiteInfoApp you can read out the levels in your tank wherever you are. It is created for the end user and ties together the functions of SiteInfo. The use of the SiteInfoApp is free to any user of SiteInfo. It is a service we provide to give the user a smarter working day. Like the browser version of SiteInfo, it is possible to customize the app specifically for your company with your own logo and the settings you find relevant. Please contact us for more information regarding the possibilities. In the graph you will gain a historic overview of the consumption in the tank over the time period of your choosing. The historic level data is saved for up to three years. 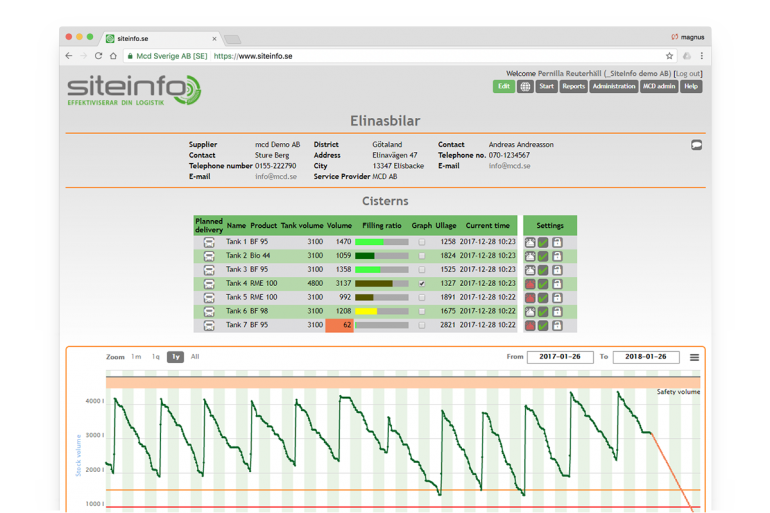 In the graph you can see the alarm and warning levels configured for the tank. You can also see the safety volume and dead volume configured for the tank. Collected level data gives you detailed statistics about each site. You are able to see the average daily consumption, the deliveries to the tank during the chosen time period and more. Based on the archived level data in the graph you are able to obtain a consumption forecast for the tank. 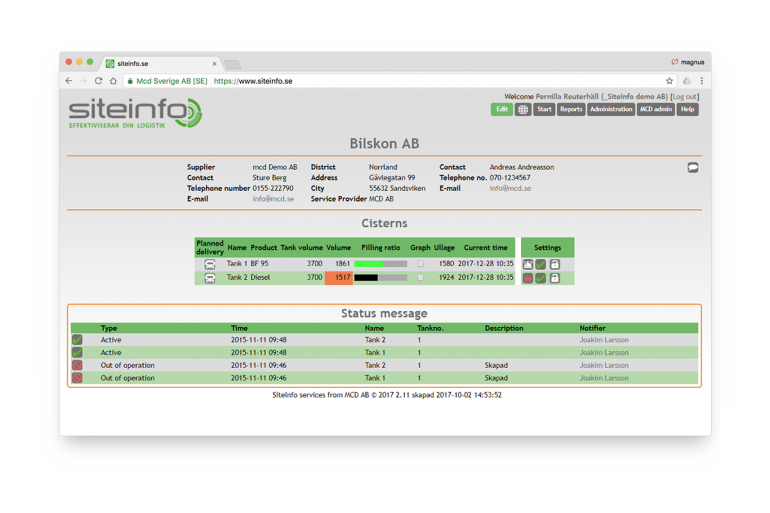 By using SiteInfo you will have access to standardized reports for things as stock and volume history. The reports are shown in SiteInfo but can be exported to Excel. By utilizing a specific set of columns and filters, you are able to create your own reports that you are then able to export to Excel. As a user with administrator rights, you have access to additional administrative functions. You are able to see the users who have access to your site, their user rights and you will be able to create new user accounts. You will also be able to edit users, contacts and products. 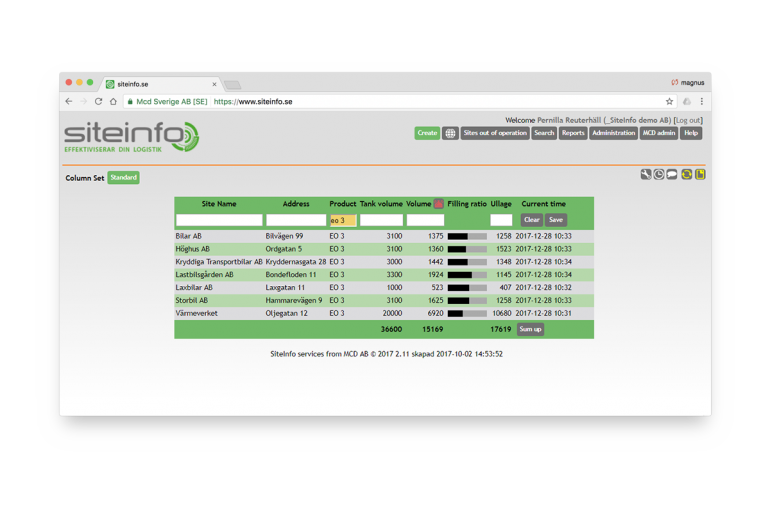 With SiteInfo and its map functionality you are able to gain an overview of your choice of tanks with alarm and warning levels. If an alarm is triggered, you will be able to see the tank in question displayed on the map. Interesting! Now I want to meet you.